Create three tables in your application. Create three one-to-many relationships among your tables. Modify field properties to set up your conditional field. The field properties let you define the conditions that determine what appears in the resulting dropdown. Each of these steps is more fully explained in the tutorial below. You can follow the steps in this tutorial to set up the application used in the example above. Note: While this is the most common and the recommended way to create conditional dropdowns, you can choose another method. Click to learn how. Follow this tutorial to set up an application with that allows you to enter employee names, countries, and cities. 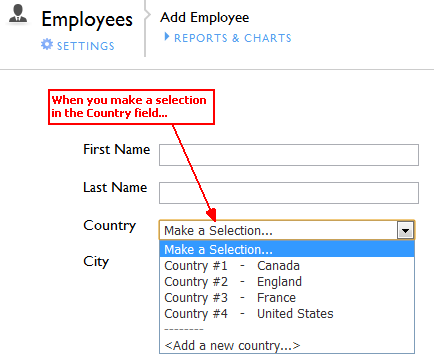 The Add Employee form should contain a conditional dropdown, allowing you to filter the cities list based on the selection of the employee's country. You'll record all information about each employee in this table. Use this table to store the names of all countries where your company has at least one office. Use this table to store the names of all cities where your company has at least one office. Your Employees table needs to have access to the country and cities lists in the Countries and Cities tables, so that you can specify the appropriate country and city when entering an employee record. Your Countries and Cities tables need to know about each other, so that you can pair each city with the appropriate country. Having the Related Country field in the Cities table lets you pair each city with a country. Having the Related Country field in the Employees table lets you associate each employee record with the right country. The Related City field in the Employees table is your conditional field. Having this field in the Employees table lets you associate each employee with the right city. 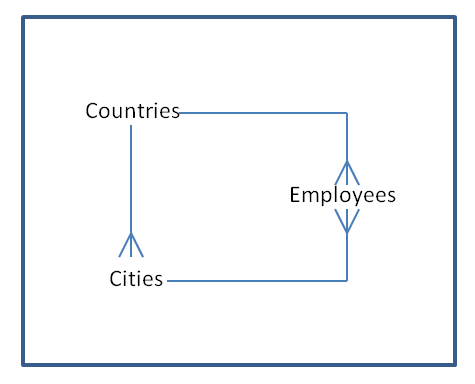 It also lets you set up conditional behavior that allows you to specify that Quick Base should check the selection of the employee's country and then filter the Related City list accordingly. For now, just make note of the reference fields that Quick Base created. You'll use these later in the process. Remember that your goal is to create a form where you can enter employee information and be able to filter the City list based on the employee's country. You can see that your Employee table now contains these reference fields: Related Country and Related City fields. The field you want to define as conditional is the Related City reference field in the Employee table. Access the field properties of the Related City field in the Employees table. Quick Base asks you select fields to complete this statement: A selection in <field1> shows choices where <field1> = <field2>. In the first field, select Employees: Country. 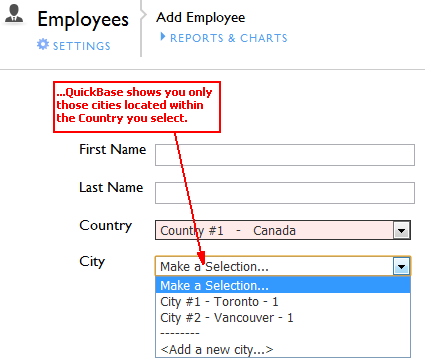 This tells Quick Base to check the value of the Employees: Country field to determine which cities to display. In the second field, select Cities: Country. This tells Quick Base to display only those cities that belong to the country the user selected. Depending on the order in which you created your relationships, your Employee form may contain an extra field (City--Related Country). If this is the case, simply edit your form properties and remove the field from your form. Once you've completed these steps, you can test your conditional dropdown by adding a new employee, Colleen Garton, to your Toronto office. From the Employees table, click + New Employee in the page bar. Enter Garton and Colleen, for Last name and First name, respectively. In the Country dropdown, select Canada. Click the Cities dropdown. Quick Base displays only the Canadian cities: Toronto and Vancouver. Select Toronto and click Save.